While many IT departments grapple with big data, IBM says it has the smallest data in the world: one bit on one atom. Researchers at IBM’s Almaden lab in San Jose, California, have written and read a bit of data on a single atom using magnetism, a feat they say is a world first. It could lead to storage that’s hundreds of times denser than anything available now, able to hold the entire Apple iTunes library of 35 million songs on a device the size of a credit card, the company says. Much denser storage could mean smaller phones, PCs, and even data centers in the future. Current hard disk drives use about 100,000 atoms to store a bit. Other scientists have used single atoms for storage before, including in experimental devices that used the atoms’ location to store data. But magnetic storage, the technique already used in tapes, disk drives, and flash, has the advantage of being solid state, so it doesn’t require moving atoms around, said Christopher Lutz, the nanosciences researcher who led the IBM project. After making one atom store a bit, Lutz’s team put two of the atoms next to each other to find out how close they could get and still be read independently. This worked with just one nanometer between the atoms. At that rate, it would be possible to store about 600 terabits per square inch. But don’t expect to see a phone the size of your little finger anytime soon. This project is pure research, intended to help researchers develop the tools and knowledge that will lead them to the next round of discoveries. In fact, the IBM team doesn’t expect commercial storage or memory devices to store a bit on each atom, Lutz said. For one thing, their experiment required conditions that aren’t practical for most devices. It needed an ultra-high vacuum, low vibration, and liquid helium for a super-low temperature. “Anything you can carry around is going to have to relax those conditions – unless it’s a special-purpose supercomputer,” Lutz said. The team just wanted to achieve the maximum possible density. Until now, no one knew how many atoms it would take to build a reliable magnetic memory bit. It turns out the answer is just one. Now researchers can use what IBM learned to develop new high-density storage that works outside a lab, probably using a small number of atoms that can help each other remain stable at room temperature, Lutz said. 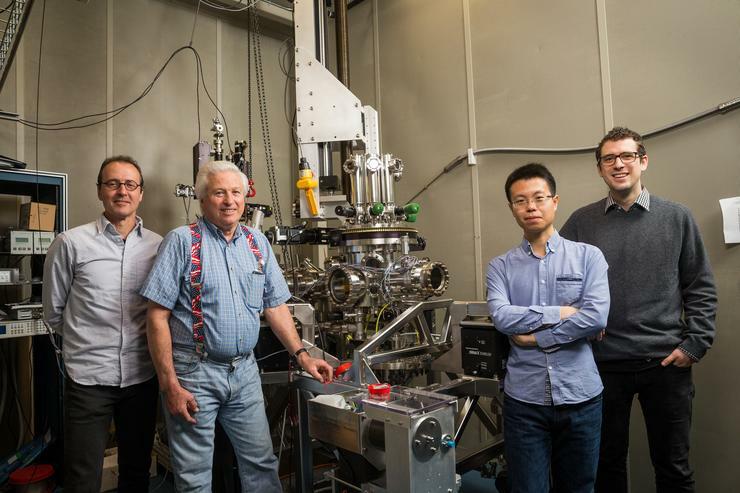 The IBM team applied an electrical current to an atom of the rare-earth mineral Holmium, commonly used in strong magnets, and magnetized it in one direction. Then they applied another current to make it “flip” and represent a different value. They applied the current using a metal needle in a scanning tunneling microscope. To read those values, IBM then used a single iron atom to measure the magnetic current passing through the atom. That technique is also new, IBM says.